Born in Colorado, Crafted in Calgary. That’s the slogan for one of Calgary’s newest and most unique breweries. If you’re familiar with Calgary’s Barley Belt then you certainly know Born Colorado Brewing. Opened in April 2018, Born Colorado has quickly emerged as a staple among Calgary’s Barley Belt and craft beer community. On this edition of Behind The Tap, we sat down with head brewer and owner Wade Brown, a Colorado native but a Calgarian at heart. 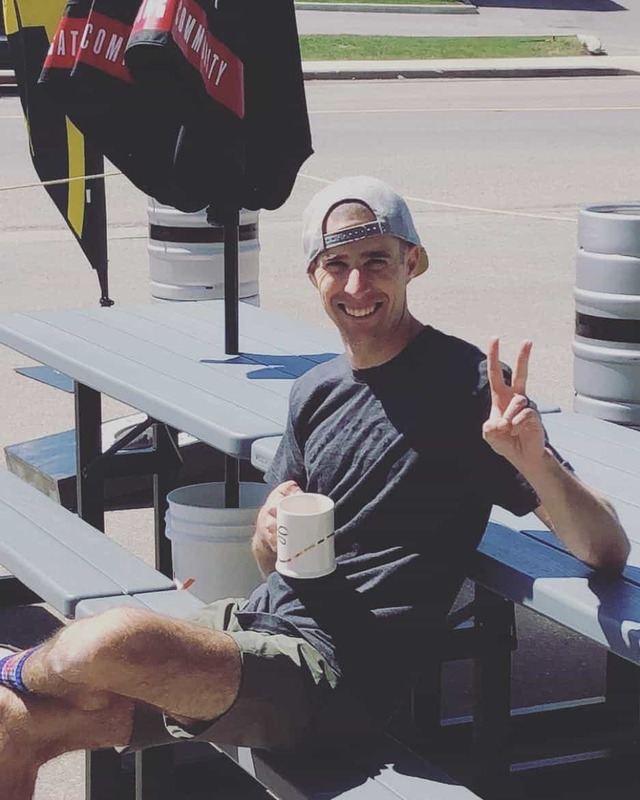 Wade tells us what brought him north of the border, how he switched from corporate life to running his own brewery, and where he believes the next major trend in Alberta’s craft beer scene is headed. Do you remember the first ever beer you shared with your dad? How old were you? Probably an Alaskan Amber when I was 17. He told me I was underage and that it was a solid beer! I lived in Wyoming at the time and Colorado didn’t have this product available so I would bring some down when I visited my family. Interesting, not sure we’ve tried Alaskan Amber, we’ll have to keep an eye out next time we’re in the U.S. Going back, before you founded the brewery in 2017, what line of work were you in? I am a structural engineer and worked in the high-voltage electrical business since I graduated university in 2010. We built substation and power lines all across North America. That’s really interesting, so many of the brewers we’ve spoken to had former careers in some type of technical or corporate role. Is that what brought you to Calgary? Exactly. That career moved me to Calgary in 2012, and in 2017 I decided I’d had enough of the corporate life and wanted to open a small business and work for myself. Alberta seemed like the ideal spot to open up shop. Wade doing a brewhouse inspection prior to shipment. We’re super glad you decided to make Calgary your home and open a brewery! Born Colorado Brewing is just that. I’m a prodigy of Denver, Colorado, and moved to Calgary in 2012. Denver and Colorado in general have a tremendous beer scene. The name of the brewery pays a little tribute to my roots but paves way for the brick and mortar brewery here in Calgary with our slogan, “Crafted in Calgary”. Born Colorado Brewing Club mugs! Very cool! That’s one thing which makes our local breweries here in Alberta so interesting, each one has it’s one unique story rooted in the lives and experiences of it’s founders. Since you’ve been in Calgary for a while now, what do you think will be the next big trend in Alberta’s craft beer scene? I think the biggest trend in Alberta right now might be going towards lower ABV beers, at least to bring in some clientele that might not be as accustom to the craft beer scene. A 9% double dry-hopped sour is pretty scary for most consumers! Absolutely, Brendan from 88 Brewing Co. mentioned this as well. We love those big, bold sours, but anyone new to craft beer will certainly want something lower ABV. Speaking of newbies, if someone were visiting Calgary for their first time and has never tried a craft beer, what would you serve them first? I would pour them my Golden Ale. It's a clean crisp refreshing year-round beer that is palatable for all walks of life. It’s a gateway craft beer with lots of lingering flavor! Enjoying a flight and a pint at Born Colorado Brewing. Ah yes! We’d had the pleasure of sampling your Golden Ale. It truly is a fantastic all-round beer! How about your first craft beer experience, was it back in Colorado? Yes, I believe my first craft beer was New Belgium’s Fat Tire. Growing up in Colorado it was pretty hard to get away from New Belgium as their home is in Fort Collins, Colorado. A close second would have been Odell Brewing’s 5 Barrel Pale Ale. Not sure which one i actually had first, but both are great beers and are still produced today. We’ve all had a Fat Tire at one point or another, it’s solid go-to beer! How about here in Alberta, what are your top three favourite beers in the province right now? I’d have to say the Nemesis IPA by Zero Issue, Forward Progress by Annex Ales, and The Dandy Baltus Van Tassel Cherry Sour. How about Born Colorado? Is there anything special or unique you’d like people to know about your beer? Our 0-60 Coffee Pale Ale uses cold brew coffee from BlackBird Coffee here in Calgary. It’s a true pale ale with a strong coffee flavor. It’s great to see you’re working with other local Calgary businesses like BlackBird! You must get a kick out of people’s reaction every time you pour a beer and they’re expecting to see something dark? Absolutely. Most people are confused when the beer is poured and it is light in color. They expect coffee beers to be dark, but that's not always the case. Switching gears a bit. Running a brewery isn’t all sunshine and rainbows. What’s one surprising hurdle you overcame of which most visitors don’t realize when they walk through your door? There is a lot that happens to make beer. It's not just mash, boil, keg. The amount of work and equipment required to make beer is a huge process that only those in the industry can truly understand. That’s a very recurring theme on this blog – unlike home brewing, the amount of energy which goes into launching a brewery and producing consistent beer is mind boggling. You will work twice as much for half the money you were making, but it will be worth every happy minute of your time! Well said. One thing we’ve noticed since starting this blog series is how resilient our craft brewers are in overcoming challenges. Their passion to produce a great product always trumps any hurdles they face along the way. As for Born Colorado, you have one of the coolest taprooms in Calgary, and Alberta for that matter! Surely, you’ve visited many memorable breweries over the years. Are there any particular breweries which come to mind as especially inspirational? My favorite brewery I’ve ever visited is Oxbow Brewing Company in Oxbow Maine. I lived in Maine for a couple years and the craft beer scene there is very rad. This brewery is a little farmhouse brewery where they use lots of wild yeast and make some farmhouse style beers unlike anything I’ve ever tasted. Sounds pretty amazing! We’ll add Oxbow to our list if we are ever visiting Maine. If you had to drink only one beer (brand or style) for the rest of your life, what would it be and why? A good old Pale Ale is the style I’d choose. A good pale has enough malty profile with the hop characteristics to pair well with anything, and usually is sessionable enough to have a little party too! Wade, thanks again for your time. It’s been a pleasure watching Born Colorado grow over the past year and we’re excited for whatever tasty brews you having coming on tap next! Keep up the great work and we'll see you around the taproom! Hey Calgary, as we enter the fall season, how does your choice in beer differ from the summer months?